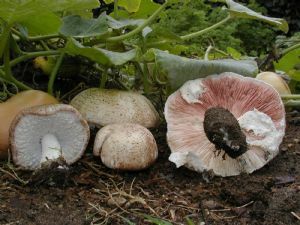 Agaricus subrufescens (syn. Agaricus blazei, Agaricus brasiliensis or Agaricus rufotegulis) has numerous names including almond mushroom, mushroom of the sun, God's mushroom, mushroom of life, royal sun agaricus, jisongrong or himematsutake. Agaricus subrufescens is a choice edible mushroom with an almond fragrance and sweet taste. It is a well-established medicinal mushroom that is widely used in Japan, China, Europe and North America.